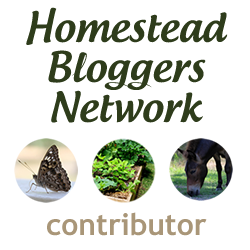 Browse similar articles on this week’s Homestead Blog Hop hosted by Simplelifemom.com! Recently someone from a canning group I’m in shared their “Instant” Iced Tea method. It’s basically making a concentrate that is canned in pint portions so that it keeps in your pantry like a jar of the instant granules do. Then, when you need to make a pitcher of tea in a hurry, you just add water. 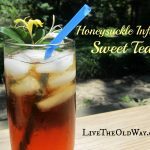 For me, there are plenty of times a pitcher of tea winds up being a picnic afterthought for one reason or another and this is a fantastic way to make it easy to grab a jar of concentrate, add water, and instantly have good, homemade sweet tea. The recipe below will produce enough concentrate to make 4 gallons of tea, but this is easily doubled if you want more in storage as it will keep for at least a year. There’s a bit of science that goes into what makes a product shelf-stable and although to my knowledge this is not an “FDA approved” recipe, (insert eye-roll here) both the sugar and the lemon contained in this recipe combined with the method and length of processing time should put a check mark in all the necessary safety boxes. The sugar is enough that you can even leave the lemon out if it’s not to your taste and pressure can it instead. If you’re at all squeamish about the safety of it, then the pressure canner is the way to go. Pressure canning takes the jar contents to a higher heat level during processing and is used for less stable items like meats and non-acidic vegetables. It wouldn’t hurt a thing to do the tea that way if that’s more in your comfort zone or if you’ve chosen to omit the lemon, aka acidity. Sidenote: For all the times I’ve extolled the virtues of everything “old way”, I’ll admit, sometimes there are truly improvements to the way things used to be. Just this canning season I came across a canning funnel made by Farberware that I may love even more than my old funnel that used to be my Grandmother’s. It fits both regular and wide mouth jars and has… headspace markings!!! I would guess most people, myself included, eyeball it, but the markings make it so nice! I’d have to do this unsweetened, too. Cannot abide any sugar or sweetener in my tea. Lemon is fine, though. (You wouldn’t guess from this that I was born in the South…) But sounds like a great idea! The sugar is not absolutely necessary. You can definitely use Citric Acid in place of lemon juice to increase acidity level in foods to be canned that should be “acidic”. I don’t remember all the specifics, but for recipes like this you can also test the pH level to see if it is acidic enough for water bath. I think it was a cooking store where I’ve seen pH meters or test strips maybe? Google might be a good start for that too. Can I do this without sugar and lemon if I use citric acid? I can do lemon if I need to, but I absolutely cannot stand any type of sweetness in my tea. So glad I found you! You are living the life I hoped to find when I married my hubs 44 years ago. I didn’t think technology had come far enuf for an underground home yet! I imagined ours to have an atrium right in the middle so that we could have natural light in all the rooms…Very good luck to you and yours new friend…I look forward to your newsletters and info coming my way! 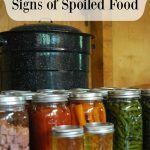 What is the canning time for presure canning? 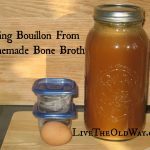 What is the time on pressure canning the tea? First, I LOVE this site. Just found it today! Second, on canning the tea, I don’t like lemon so, from what you are saying above, it’s alright to just use sugar then water bath or would using the pressure cooker be a little safer? Question, how many small tea bags equal the family size ones? Also can this be done with any type of tea? thank you. Hey Caroll! To be shelf stable it would need either the acidity from the lemon or to pressure can it, preferably both. You could look into using citric acid as a preservative maybe? I’m not well versed on that though. Would this be safe unsweetened and sans lemon?